Just when I thought I'd fulfilled my "bucket list" requirement for 2014 with a magical trip to the Galapagos Islands, my husband Tony and I received the incredible opportunity to travel with the outfitter Baja AirVentures from San Diego to the Gulf of California for the truly once-in-a-lifetime experience of swimming with docile whale sharks, the largest "fish" in the sea. Getting there was half the fun. 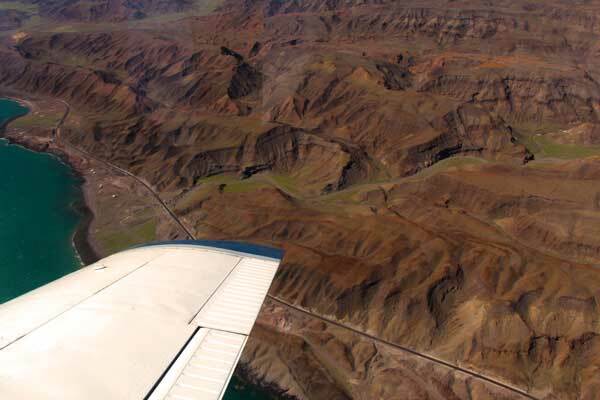 Gliding over the massive terrain of the Baja California Peninsula and the coastline of the Gulf of California was almost a religious experience...it was so breathtakingly beautiful. Before we knew it, our plane gently descended onto the air strip at Bahia de los Angeles to begin our adventure. A scenic boat ride from town brought us to Las Animas Eco-Lodge, where our expectations were again exceeded, as we really weren't expecting such comfort in such a remote location. As we pulled into the placid harbor and docked on the expansive, white sandy beach, we felt as if we were part of a “world’s most beautiful beaches” travel magazine spread. This is "glamping" at its finest (glamorous camping for those of you not familiar with this term). The meals were lovingly-prepared and tasty and we often enjoyed fresh fish caught that day as well as ceviche and other local specialties. The staff was exceptional in all aspects, genuinely eager to please us and cater to our every need. Our pilot guides Fred and Andy, in addition to being expert aviators, astounded us with the scope of their vast knowledge of the history, wildlife and fauna of the region. Their guidance did much to enhance our appreciation of this magnificent place, and their genuine love of Las Animas shone through in all their communications with our group. Why did we choose this trip? A recent visit to the Galapagos Islands in March of this year whetted our appetites for more such soft travel adventures. 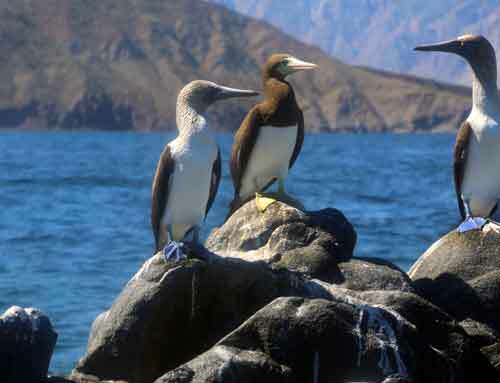 We had heard from friends that the Midriff Islands in Baja California’s Gulf of California is known as “The Galapagos of North America” so we were intrigued. 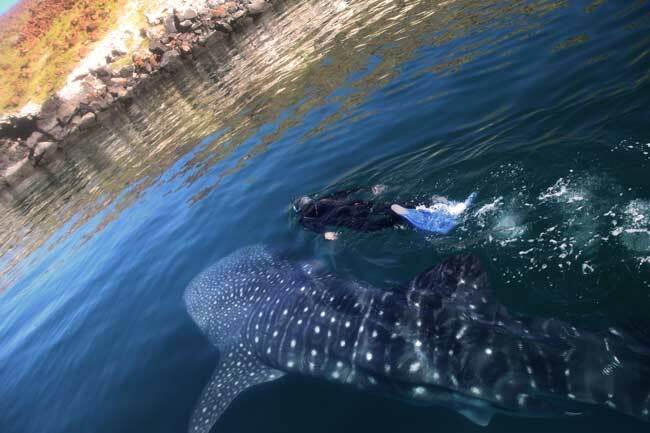 A quick internet search brought us to the Baja AirVentures web site, where (after reading all the glowing reviews) we booked the “Whale Shark” tour. And YES, it is the Galapagos of North America! Topographically, the regions are very similar, although we enjoyed a rare occurrence: the greening of the otherwise arid desert landscape because of the heavy rains of September. As in the Galapagos, we viewed blue-footed (and even yellow-footed) booby birds, magnificent frigates, countless sea lions, Sally-Lightfoot crabs, manta rays, sea turtles, dolphins and many other species both regions share. And while giant tortoises don't roam the wetlands as in the Galapagos, the gentle, magnificent whale sharks more than make up for this omission. The highlight of this voyage was to experience the proximity of these rare and elusive creatures. At one point, we counted 24 gentle giants swimming around us. Unbelievable! I must mention that even though you may not feel inclined or capable of jumping in the water to swim with the whale sharks, you will be able to admire them just as easily from the excursion boat that took us out daily. I also must add that we were a group of 8 travelers from around the country (of various ages and walks of life) who started out as strangers and departed as friends, bonded by memories of a magical travel experience. On our final evening, several of us walked along the shore and watched the sparkles under our feet and the glowing fish in the waves, the bio-luminescence phenomenon of the ocean that I have read about but never experienced. And oh, the heavenly sky in this wilderness defies description. I’ll never forget the site of that jet black globe peppered with glowing stars and constellations, including a magnificent Milky Way the likes of which I’ve never seen and will never forget. We may be physically back home in San Diego, but our hearts are still on the shores of Las Animas Wilderness Lodge. And I suspect they might remain there for quite a while….. Since a picture is worth 1,000 words, please log onto my PHOTO WEBSITE for a gallery of photos of this incredible adventure.